This is a very common dish because it’s delicious, quick to make, and is a great way to use older cabbage kimchi that has become too sour to eat by itself. You actually shouldn’t bother to make this with fresh kimchi, since it won’t have enough flavor soaked in yet to make the broth taste right. I’ve adapted a few recipes together here according to my own tastes – you can leave out the pork marinade if you’re in a hurry. I’ve also included a vegetarian option if you like, just substitute chopped eggplant for pork. One of the cookbooks I read pointed out that this is great camping food if you bring a bit of kimchi and a can of tuna instead of pork. Although most recipes I saw called for firm tofu cut into chunks, I like using silken or soon tofu – the softest kind. In a spicy soup like this, it’s sort of a cross between poached egg and a big spoonful of sour cream in a bowl of chili. Both the smooth texture and mild flavor are a nice contrast to the spicy soup and chunks of veggies and meat. Soak the mushrooms in warm water – it takes about 30 minutes to soften whole mushrooms, less for sliced ones. Slice the pork into bitesize pieces or chop the eggplant into bite size pieces. Combine the rice wine through sesame oil and mix together with the pork or eggplant for a quick marinade. Slice the kimchi into thin strips – for spicier soup, squeeze out the juice and add it back with the water or broth later. For milder soup, rinse the kimchi before you chop it. Heat up large wok or heavy stockpot. Add the vegetable oil, then cook the pork until no longer pink. Add kimchi and garlic and saute for 3 minutes. Add broth and bring to a boil, then cook for 5-10 minutes before adding tofu and sliced mushrooms. I like to use the soon tofu and add it in large spoonfulls, since it does break up a bit as you stir it. Slice the green onions into 1/2″ pieces on the diagonal, reserving some of the bright green tops for later. Chop the bean sprouts into 1/2″ pieces as well and add to the soup with the white parts of the onions. Simmer for another 5 minutes, then serve with hot rice with the reserved sliced green onion tops as a garnish on top. I haven’t uploaded all my photos to the blog yet, but you can find them on my flickr account here. Wow, Emily! I didn’t know you made significant number of Korean food. Eggplant and shitake mushroom are some ingredients hardly used for kimchee stew. What kind of flavor they add to the stew? and add dried anchoby stock gradually. Also,I use pork with some fat to add better flavor to it. This was a very common food for middle class Korean people late in 1900s because beef was fairly expensive. However, pork and chicken were affordable. 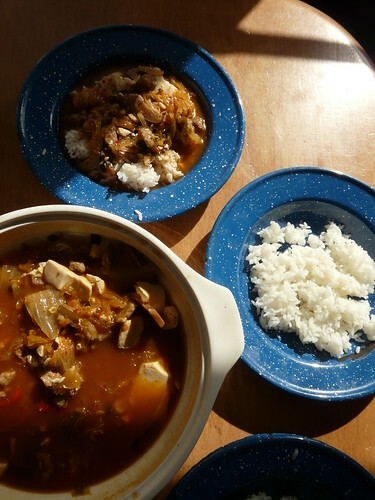 Since majority of people didn’t take in enough fat from food, they used fatty pork for kimchee stew. I think early Americans did the same thing. I will try your recipe some time in the future. Yes, I like soft tofu for this, too. Did you ever make soon-tofu stew? I have an excellent recipe a lot of my American friends loved. Also, for better tasting kimchee stew, use kimchee with less fish sauce or none. I love your food website which makes mouth water. Thanks for your feedback, Taeyoung! I like to learn from more experienced friends like you who can help me know if there are techniques (add broth slowly) or context (why pork?) that will help me understand each dish better! I will have to look up my recipes in my cookbooks to see if I was following advice or experimenting with adding the mushrooms. I think the suggestion to use eggplant for vegetarians came from another source, but maybe not? I don’t know that I’ve ever made it the vegetarian style myself. I like pork!